I am glad you read my blog. I thank you for your time. But let me tell you something frank! Your comments which I had printed above in red are disgusting. I don not blame you because it is somewhat common to Adventists in the guise of following the Ten Commandments to charge people falsely. Maybe, it is the spirit that flows in some members of your congregation like you and Mr. Scott. When you said, “Be careful with your mouth preacher! Do not speak great words against the most high”, you are in utter defiance of the 9th of the Ten Commandments, which you are hopelessly defending. It is not my mouth which said that the Old Testament can not sanctify or justify anybody anymore. It is the mouth of God! It was God who said that He is making a new covenant which made the previous old and destined to vanish away. Can you not see the verse? Or are you blinded by your fanatical adherence to your church? To prove that it was God’s mouth who pronounced and said that the former covenant was made old by the new, let us copy another verse from your bible. (Hebrews 8:6-10) “But now hath he obtained a more excellent ministry, by how much also he is the mediator of a better covenant, which was established upon better promises. For if that first covenant had been faultless, then should no place have been sought for the second. For finding fault with them, he saith, Behold, the days come, saith the Lord, when I will make a new covenant with the house of Israel and with the house of Judah: Not according to the covenant that I made with their fathers in the day when I took them by the hand to lead them out of the land of Egypt; because they continued not in my covenant, and I regarded them not, saith the Lord. For this is the covenant that I will make with the house of Israel after those days, saith the Lord; I will put my laws into their mind, and write them in their heart…“ emphasis mine in red. Let us decipher these verses. If you will notice, the verse speaks of a better covenant. The adjective better is used, grammatically, to compare two different things. The Lord Jesus Christ is the mediator of a better covenant,. meaning, that before he became such, there was a former covenant. What kind of a covenant was the former? Let us read verse 7. It was the mouth of the apostle Paul or the writer of the book to the Hebrews who said this, not mine. The first covenant, in comparison to the second, was described by Paul as ‘faulty’. Again, Mr. Adventist777, I want to reiterate that it is not my mouth that said this. Thou shall not bear false witness against thy neighbor (Exodus 20:16). Remember, that is the ninth commandment! Now, what happened to the ‘faulty’ first covenant? He said on verse 8. It must be understood that the first covenant, which became faulty, was also given to the house of Israel and to the house of Judah. The same nation that received the first covenant will also be the recipient of the new covenant. What was the first covenant that was given to the house of Israel and the house of Judah? Let us read verse 9. The verse said that the second covenant will not be according to the covenant He made with the fathers of the nation of Israel, which God gave them after they were liberated from Egypt. What was that covenant that was given by God to the Israelites immediately after they left Egypt? So, it is crystal clear that the covenant given to the Israelites at Mount Sinai, after they left Egypt, are the Ten Commandments written on two tables of stones. To prove that this covenant is the Ten Commandments on two tables of stone that was given by God after they left Egypt, let us read Exodus 31:18. 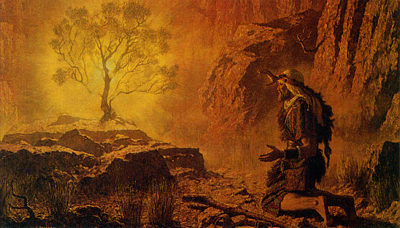 Moses was the recipient of the first covenant to be given to the people of Israel. Jesus Christ will be the minister of the new or the better covenant. Now, we know that the term ‘better covenant’ was used to describe the comparison between the covenant received by Moses — which are the Ten Commandments; and the covenant wherein the Lord Jesus Christ is the mediator. These facts tell us a great truth. In the book of Hebrews, the apostle Paul speaks to the nation of Israel or the Hebrews about “a change”. Notice two important facts in the preceding verse: There was a change of priesthood and there was a change of the law. May I remind you, Mr. Adventist, that I am not the one making the change. This verse was written in the bible even before my great-great grandparents were born. Do not use Daniel 7:25 against me, which your leaders are using to accuse the Catholic Church who, according to them, changed Saturday to Sunday. Catholics will not answer you, but treat me not like them; for I will answer you with the Bible wherever you may be; wherever you may go. It was the apostle Paul who said that there was a change of the priesthood and the law. What was that priesthood that was changed? It was the priesthood of the Levites — the tribe where Moses came. It was this priesthood that was commanded by God to collect ten percent (10%). I know that Seventh Day Adventists now vehemently insists that their members give ten percent aside from other offerings; but mind you, these are for the Levitical priest under the priesthood that was ‘changed’. The priesthood of Christ and the Church of God is the priesthood in the Christian dispensation. This is the replacement of the Levitical priesthood, that was changed. The Church of God was made priest with Christ as the chief. Christ as the chief priest of the Church of God who replaced Moses; and his priesthood; and his laws. Jesus Christ is the best replacement for Moses and his priesthood. Remember, when the priesthood was changed, there was also a need for the change of the law. The laws administered by Moses are the Ten Commandments written on two tables of stones: It is the first covenant; but the new is better. In fact, the Bible called it a better covenant. It is the covenant under the administration of the best priest ever, Our Lord Jesus Christ. The first covenant, compared to the second, is declared faulty. It is not I, who said this, but the Bible. How do we determine the difference between the two covenants? Making the latter better than the former. The New Testament or the new covenant is of the spirit and gives life but, the old are letters and it kills. Which are these letters that kill representing the old covenant or testament? It is clear, therefore, that the letters that killeth are the letters written and engraven in stones, which are the Ten Commandments — also called “The Old Testament”. Anybody who transgress the law of Sabbath will be stoned to death. The new covenant is of the spirit and it gives life. The new covenant is the teachings of the Lord Jesus Christ or his gospel. The new covenant is not written on stones, but in fleshly tables of the heart. It is God the Father Himself that writes the New Covenant in the hearts of Christians. The new covenant is ably administered by the Spirit of God and the apostles. While the former covenant or testament was administered by angels. Better still; let us discover the root of these two covenants or testaments. In this allegory, the two women who bore the two sons of Abraham are the two covenants. One, represented by Hagar, the bondmaid of Sarah: figurative of Mount Sinai, from where the first covenant or the Ten Commandments were given to Moses. The other covenant or mother represents Sarah, a free woman: figurative of Jerusalem above, from whence the New Testament or covenant came — which is the mother of us all: The Christians. So, it is very clear that the mother of ‘us all’ (Christians), according to Paul is not the Ten Commandments or Hagar (whose son was born after the flesh), but, Sarah, the free woman representing Jerusalem above who is the mother of us all — born by promise. Are there sufficient evidences to prove that the new covenant or testament is far better than the covenant which contain the law on Sabbath?